Northants skipper Stephen Peters made his highest score of the season so far, but Peter Siddle gave Notts the upper hand on day two at Trent Bridge. Peters batted for almost three hours for 88 after the rain-delayed match finally got under way at 13:45 BST. He shared an opening stand of 107 with James Middlebrook (47) before both fell to Australia Test star Siddle (4-75). Notts have won seven and drawn five of their last 12 home Championship games against Northants. Northants slumped from 152-3 to 179-5 and Ajmal Shahzad then weighed in with 3-44 to reduce them to 241-8 at stumps. Having been put in by Chris Read, Northants made the most of some wayward bowling in the early stages. However, Siddle eventually found the right line to have Middlebrook caught behind and then bowled David Sales (10), who offered no stroke after hitting two boundaries earlier in the over. Peters collected eight boundaries and looked well set for the 32nd first-class century of his career when he was caught by Andre Adams, and Andrew Hall edged Shahzad to the keeper three overs later. Rob Newton made an attractive 37 off 46 balls before Shahzad trapped him lbw and the ex-Yorkshire seamer had the final word when Steven Crook attempted an ambitious drive and Siddle took the catch at point. "Having lost so much time to the rain, it was perhaps understandable that Notts were not at their best when play did eventually start. "Eager to make early inroads, there were too many four-balls sent down, but all of the bowlers improved considerably when they returned for later spells. "Two dry days will be needed though if a positive result can be conjured up from this position." 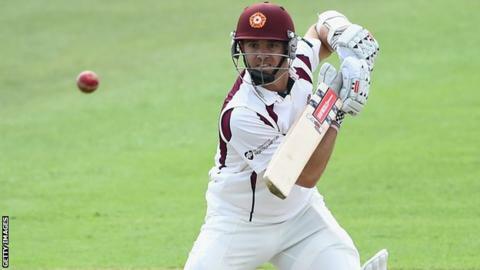 "Northants only picked up four batting bonus points from their first three matches of the season and must have sensed their chance to add to that when Stephen Peters and James Middlebrook posted a century partnership for the first wicket. "Peter Siddle apart, Notts' bowling was indifferent and Northants may feel they were not been sufficiently ruthless, as only Rob Newton offered sustained resistance after that opening stand with his 37. "Even with four sessions lost to the elements, a positive result is not impossible for either side. "This pitch does offer assistance and the visitors have the attack to threaten Nottinghamshire, but they must bowl well."